Enormous lead-filled bronze weight with massive hook on top suspended from loop hole. The female bust cast in the form of a the bust of the Goddess Athena or Minerva. She wears a Corinthian helmet and garment with aegis on the chest. Numerous details in cold work. 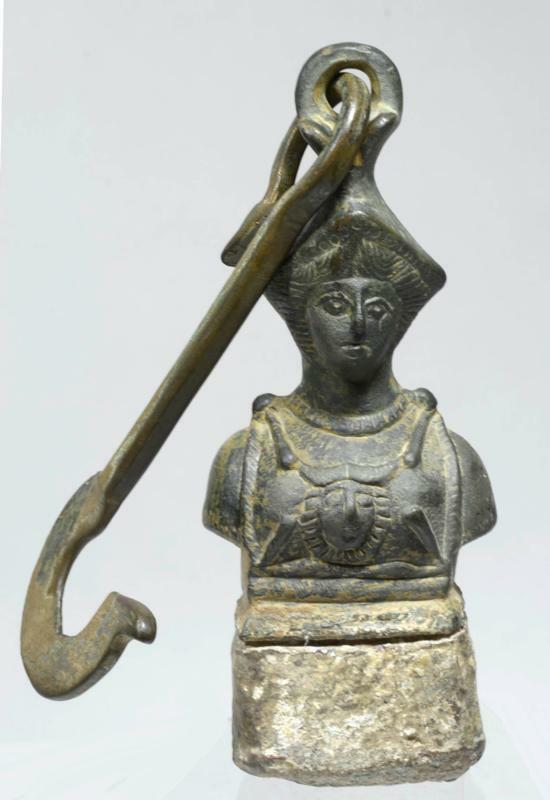 Athena, the ancient Greek goddess of wisdom, could often be seen on steelyard weights even after Christianity was made the official religion of the Empire. Imperial & religious images decorated the steelyard weights to enhance their authority as accurate measures. This is a massive weight at 15 lbs. 6.8 kilograms or 35 Byzantine litare. Steelyards (a Roman invention) were used to weigh the goods by being hooked and slid along a rod to balance the load suspended from hooks and chains on the other end. Size: 10 inches 25.5cm H. In addition a copper hook (L 10 inches 24cm). Provenance: Ex Shlomo Moussaieff Collection, 1948 - 2000. Exported from Israel with export license from Israeli Antiquities. According to the Metropolitan Museum of Art, Trade in Byzantium was very robust. Byzantium was the center of international trade routes extending from the Pacific to the Atlantic oceans that transported bulky materials, like lumber, food, and textiles, and smaller goods, including spices, precious metals and jewels. The state strictly regulated trade and established standardized weights to ensure fair measures. This steelyard weight would have been used to weigh heavy materials.